Exiled former Higher and Tertiary Education minister Jonathan Moyo (pictured) has declared that he is ready to face President Emmerson Mnangagwa's government in international courts if it tries to extradite him to face trial for the alleged theft of Zimbabwe Manpower Development Fund (Zimdef) money. 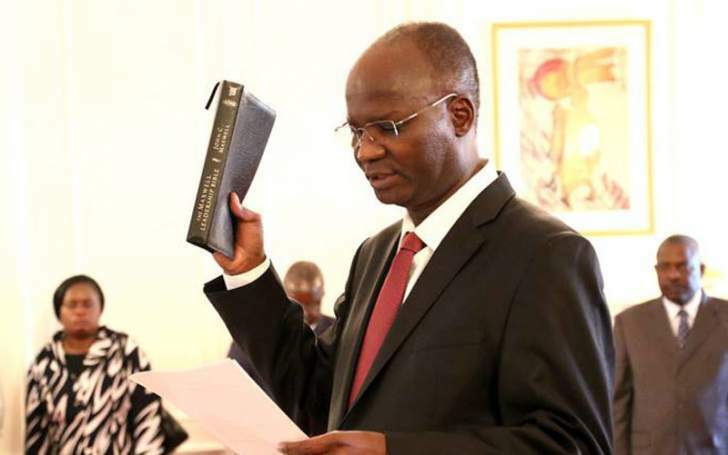 In a response to questions emailed to him by The Standard (TS) last week, Moyo (JM) said the army tried to kill him during the coup that toppled former president Robert Mugabe last year and he had no faith he would get justice in Zimbabwe. Below is the rest of the Q&A, whose first part was published last Sunday. TS: Some of your former colleagues in the Higher and Tertiary Education ministry appeared in court recently in the Zimdef case where you are also being implicated. Do you have any intentions to clear your name? JM: If a mad person accuses you of having an affair with your neighbour's spouse, would you run to that very same mad person to clear your name? TS: Are you afraid of being arrested for the crimes you allegedly committed? Will a Zanu-PF win not prolong your stay in exile? JM: I have never been afraid of being arrested by a competent constitutional authority with the constitutional powers of arrest. The record will show that I have always challenged through the legal process Mnangagwa's use of his well-known political cronies like Goodson Nguni to abuse the Zimbabwe Anti-Corruption Commission (Zacc) to harass and arrest Mnangagwa's perceived political opponents. Nguni is not a law enforcement official. He is Mnangagwa's henchman dating back to their Zambia days and an alleged fugitive from justice in South Africa. Just like the sun will rise tomorrow, it's not whether, but when the wheels of justice will catch up with Mnangagwa's use of Nguni to illegally harass and arrest Mnangagwa's political opponents. In the wee hours of November 15, 2017, some 15 heavily armed soldiers shot their way into my home and into every room in the house with the manifest intent to kill me. By the grace of God, my family and I had vacated the house, but the trail of military destruction they left behind speaks for itself and I can't wait to have my day in court, not just in Zimbabwe when justice is restored but internationally, about what the military did at my house on November 15, 2017. Only idiots think what the military did at my house on that day was an attempt to effect a lawful arrest and that, given what happened, I should subject myself to the coup government and expect justice. The coup minutes are clear that they wanted to kill and not arrest me. So, no, I'm not afraid of Mnangagwa's henchmen like Nguni. With the evidence that's now available, including affidavits and coup minutes, it would be great to engage Mnangagwa's henchmen in an extradition hearing in a neutral country where the rule of law is a reality. I'm itching to meet them in a competent open court under the rule of law. As for your supposition of Zanu-PF winning the next elections, I don't see how a party that died after it humiliated its founding leader, President Robert Mugabe, in a bloody military coup can win any election. So, no worries about Zanu-PF winning an election as that will not happen. TS: Does the high number of youths seeking to represent Zanu-PF in the forthcoming polls indicate a rebirth of the ruling party? JM: Rebirth of Zanu-PF? There's no Zanu-PF anymore and candidates are not described by those who submit their CVs, but those who are in fact selected. So, the question of who will represent Junta-PF in the forthcoming elections will be known after May 5, 2018 after Junta-PF's primary elections. This is because Zanu-PF is dead; and a dead party cannot be reborn. Maybe it can be resurrected, but Easter was two weeks ago, and we did not see any resurrection, so that's out. If it's going to be a reincarnation, then we are not talking about Zanu-PF, but about something else. TS: How do you rate Zanu-PF's chances in the forthcoming elections taking into consideration that for the first time the ruling party is going to the polls without Robert Mugabe as its leader? JM: Zanu-PF died with Mnangagwa's ouster of President Mugabe in a military coup spearheaded by [retired General Constantino] Chiwenga. What now remains is for what was Zanu-PF to be buried at the polls. Mnangagwa and Chiwenga, the two people who betrayed President Mugabe, know this and that's why they are not campaigning. Already Mnangagwa himself has said the past is dead. He cannot say that and not realise that what he in fact means is that without President Mugabe, Zanu-PF dead. TS: You have been accused of playing a leading role, working with the military in manipulating the 2008 election. Now that you are out of government and you had a fallout with some of those commanders that you allegedly worked with, are you now prepared to reveal how the polls were rigged? JM: An accusation is just that and is thus not a fact. I was not in government or Zanu-PF in 2008. I was then an independent Member of Parliament for Tsholotsho North. The claim that I worked with the military to manipulate the 2008 election is as startling as it is idiotic. Otherwise, there was no manipulation or rigging of the 2008 election, so to speak, by elements of the military, but there was an outright electoral coup and that's common cause. There's no need to dillydally or beat about the bush regarding that fact. There are many reports about it including one done by a team of former members of the South African National Defence Force sent by former South African president Thabo Mbeki. It's common cause that Sadc and the AU intervened in Zimbabwe in 2008, and the UN threatened sanctions to the point of having the Security Council seized with the matter, precisely because of the fact that there was an electoral coup in 2008 by the military. The Sadc and AU intervention led to the amendment of the constitution of Zimbabwe and the establishment of the GNU [government of national unity] based on the inter-party agreement between Zanu-PF and the MDC formations, famously known as the Global Political Agreement or GPA. The Junta-PF commissar, [retired] Lieutenant-General [Engelbert] Rugeje, has threatened that the military will repeat the 2008 electoral coup in 2018. Mnangagwa's uncouth henchmen such as Josaya Hungwe and Chris Mutsvangwa have echoed Rugeje's sentiments while there are coup minutes that are now in the public domain, which confirm that the military has embedded thousands of its officers for the 2018 election in every community in the country, not just in rural areas, but in the whole country. With all this evidence, it's shocking that you want to find out from someone who was not in government in 2008 and who is not in government in 2018 to reveal how the polls were rigged in 2008. There was no election rigging in 2008, comrade, there was an electoral coup by Mnangagwa and his henchmen who are threatening to do the same in 2018 and they are emboldened by the November 15, 2017 coup which they say was a transition when it was a bloody coup. TS: During your time in Zanu-PF, did the party rig elections and if so, how was the manipulation done? JM: As a political party, Zanu-PF has always been clueless about elections, but has always benefited from the power of incumbency through government officials and the security apparatus that is run and controlled by securocrats. But the point is I never ever participated in any general election in Zimbabwe as a government official. Not even once. Remember that I served in government for a total of not more than eight years from 2000 to 2005 and from 2013 to 2017 and on both occasions, I did not complete the full terms. My first election was in 2005 and I was not in Zanu-PF or government as I contested as an independent candidate and the same is true for my second election in 2008. In 2013 I participated in my third election, this time on a Zanu-PF ticket, but I was not in government. Whereas I won my first two elections in 2005 and 2008 as an opposition candidate, I lost in 2013 as a Zanu-PF candidate. I'm at a loss as to how you expect me to know anything about what you say is the rigging and manipulation that was done when I lost an election whose alleged rigging was supposed to benefit me. It's public knowledge that I unsuccessfully challenged all the way up to the Supreme Court the 2013 election result in Tsholotsho North on grounds that the election had been rigged against me in favour of the MDC-T candidate. So, the election rigging narrative is complex and cuts both ways. The lessons I've drawn are that opposition political parties should be careful about self-defeating rigging narratives, which create the false impression that the ruling party has a foolproof rigging capacity. The bottom line is that first, opposition parties must ensure they have technical, legal and political experts who understand the design and operation of the voting system from start to finish and who can identify and challenge anomalies. Second, opposition parties must field candidates at least in all the 1 958 wards for local elections and all the 210 constituencies. Not having these candidates allows Zanu-PF to stuff ballots and increase its provincial totals to influence proportional representation seats. Third, opposition parties and independent candidates must, well ahead of the election, identify and train capable election agents and deploy a sufficient number of at least four such agents in each of the polling stations in the constituencies they are contesting and for political parties the requirement is to have four polling agents in at least 9 760 polling stations (based on the 2013 poll) across the country. The absence of polling agents or the fielding of incompetent, fearful or manipulatable ones creates huge room for rigging elections, especially when it comes to under or over-counting of votes at polling stations or collation centres. TS: Do you have any evidence to back your claims that soldiers have been deployed to campaign for Zanu-PF and what exactly are they doing in the communities? JM: The evidence is in the coup minutes that were written by the secretary of the coup makers, George Charamba, and which were confirmed by Father Fidelis Mukonori and the deputy director-general of the CIO [Central Intelligence Organisation] , Aaron Nhepera. These shocking coup minutes have been in the public domain for two or so months since last January when NPF (National Patriotic Front) attached them to its AU and Sadc petition. The coup minutes have not been denied or impeached not least because their authenticity speaks for itself. The soldiers who are now embedded in every rural and urban community in the country are not just campaigning for the Junta-PF, but are also preparing for a possible electoral coup like the one in 2008. Remember where soldiers are deployed, don't expect a picnic. TS: Your name has been linked to the NPF led by Ambrose Mutinhiri. Can you please clarify your role in that party and what it stands for? JM: I have no role in NPF other than that I'm linked to it as are most comrades who were in Zanu-PF before that party was killed by the coup on 15 November 2017. As to what NPF stands for, I'm sure you can direct that question to Ambrose Mutinhiri or Jealousy Mawarire who speak for NPF. TS: You have been complaining about the alleged harassment of Mugabe and his wife by the new government. Can you please explain how he is being harassed by the same government that has pledged to take good care of the former president? JM: The issue of the harassment of President Mugabe and Amai Dr Grace Mugabe is now in the public domain and is, as such, now common cause given its regular coverage in the local and international media. TS: How has been your relationship with Mugabe since the coup? Do you still communicate and what issues does he talk about? JM: It's not been possible for me to communicate with President Mugabe since the coup. I hope that will change sooner rather than later. TS: Recently, you said the government does not own a single share or fraction thereof at Zimpapers. How then or on what basis has government controlled Zimpapers as it did during your days as Information minister and as it continues to do so today? JM: Yes, I said that. It's an open secret that the board, management and editorial staff at Zimpapers were appointed, as has been the case since 2005, illegally by a government minister who has no authority to make the appointments or to cause them to be made. It's a fact that the administration of Zimpapers by the Ministry of Information is illegal and in violation of a host of laws, let alone the constitution of Zimbabwe. The matter is so serious that it could cause the delisting of Zimpapers from the Zimbabwe Stock Exchange among other many consequences. TS: The new Higher and Tertiary Education, Science and Technology Development minister has basically reversed your Stem policy programme that gave scholarships to 'A' Level students and scrapped having 'O' Level Maths and English as prerequisites for tertiary college and university entry. What do you think about these developments? JM: There's a tradition in that ministry which I respect, which is not to criticise or say anything that affects one's predecessor or successor even though in this case we have an incumbent appointed by an illegal and unconstitutional regime. All I can say for now it that it is daft and irresponsible not to require 'O' Level English and Mathematics as prerequisites for entry into tertiary or higher education. I did not initiate or make the policy on this. I found it and enforced it because it is progressive and is in the national interest if Zimbabwe is to produce the high-end skills needed for the country to industrialise and modernise. The same goes for the Stem scholarships for 'A' Level students. I have seen illiterate and downright stupid arguments against those scholarships. I know this is going to be an election year, handeitione. The coup government is anti-people and anti-science. Mnangagwa would rather have Jah Prayzah singing Kutonga Kwaro to promote Lacoste nonsense about Mnangagwa and his ill-fated regime rather than sing Stem Ngazviende Mberi to promote the development of science, technology, engineering and mathematics in the country for prosperity into posterity.